Tree well and deep snow suffocation is a serious problem in the Western USA and Canada. Incidents occur with deep snow accumulations and tree well immersions, where a skier or snowboarder falls into an area of deep, unconsolidated snow and becomes immobilized. Since 2001, there have been more snow immersion deaths in California (15) than any other state. A tree well is a void or depression that forms around the base of a tree, and most likely under the branches that hang from those trees, disguising the void. This void may contain a mix of low hanging branches, loose snow, and air. While skiing or snowboarding, it is very difficult to determine if a tree well exists, so skiers and riders should treat every tree the same. Skiers and snowboarders must understand the risks of deep snow, educate themselves, and strictly adhere to safety recommendations, including always skiing or riding within sight of a partner, especially when off a designated trail, within the trees, or a gladed area. • Each skier or snowboarder controls his or her own level of risk. Only you can prevent this type of accident from happening. Always ski or ride with a partner, and within close sight. To minimize your risk, you must know how to travel safely with your partner(s) in these ungroomed deep-snow areas. • Always stay in visual contact so that your partner(s) can see you if you fall. Visual contact means stopping and watching your partner descend at all times, then proceeding downhill while he or she watches you at all times. It does no good if your partner is already waiting for you in the lift line while you are still descending the slope. • Stay close enough to either pull or dig out. 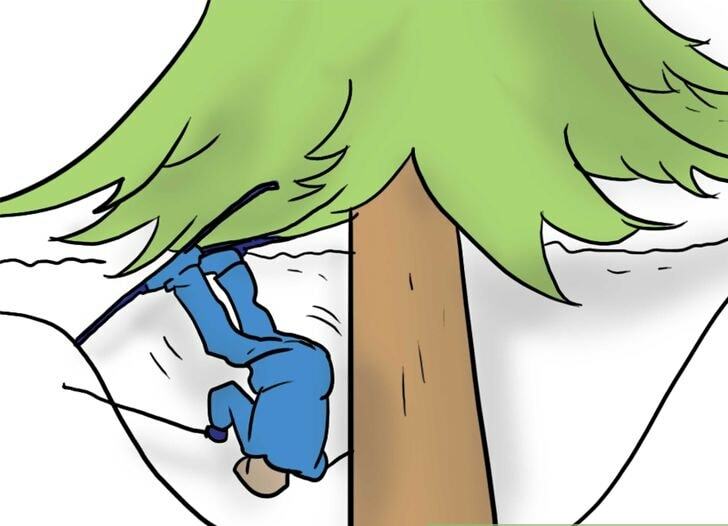 If you have any question about what “close enough” to assist someone in a tree well is, hold your breath while you are reading this. The amount of time before your partner needs air may be how much time you have to pull or dig the person out of danger. Other factors such as the ability to create an air pocket or the position of the entrapped skier may also affect this critical timeframe. • Remember, if you lose visual contact with your partner you could lose your friend. It is important to know that most people who have died in deep snow or tree well accidents had been skiing or riding with a partner at the time of their accident. Unfortunately, none of these partners was in immediate visual contact, so they were not able to be of help in a timely manner. • Use appropriate equipment to minimize risks. When skiing or snowboarding in high-risk areas for deep snow or tree wells, wear a helmet, enter the ski patrol’s phone number into your smartphone, and carry a whistle in case you need to get someone’s attention if you become entrapped in deep snow or a tree well. • If you still have questions, contact your ski patrol. 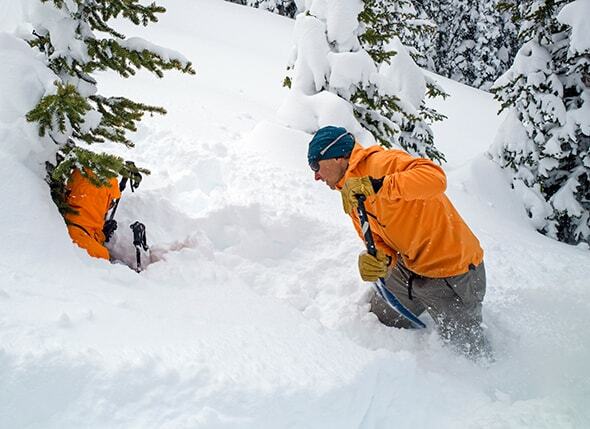 Ask your ski patrol what the current risks and conditions are with deep snow at your local ski area before you explore risky terrain such as treed areas, glades, or off-trail terrain where deep snow and tree well risks exist. Follow these helpful tips to stay safe on the Mountain. All the recent snowfall in California along with more in the forecast makes for dangerous conditions out there, so always take necessary precautions and never venture out alone. I’m sure that’ll help when you’re chocking on snow. I think you need to add wearing an avalanche transceiver and to remove pole straps from you wrists. Using easy release poles is a great option. For sure not having your straps of your poles on. Need to have hands and arms free to create an air pocket or to move in general. Theres is a rescue app specifically designed for skiers and this exact scenario. It’s called AirFlare, I recommend you check it out. I am a rescuer, not affiliated with the app company at all.